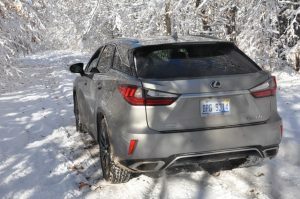 It’s time for some relaxing, solitary road therapy as I review this brash new Lexus RX 350 F-Sport on an unstructured excursion to a popular ski resort in pristine northern Michigan. It is nearly ski season but we’ve had such a mild fall the colors still cling to the trees. They’ve just enjoyed their first significant show up north, though just a few inches. From my home base in south central Michigan it would be a 3-hour drive if I took the freeways, but I’ve allotted the whole day to enjoy a classic shunpiker’s drive with camera at my side. Shunpiking means following a format rather than a script. We ‘shun the turnpike’ taking the back roads, in the spirit of Charles Kuralt, being open to discoveries along the way. The shunpiker’s format also includes finding our way to a destination intuitively – maybe with the help of a map, but not necessarily. We have no schedule nor prescribed route. It also favors occasionally exploring to the end of a road, either on purpose or not, particularly out in the scenic wilderness. Our ride, and partial excuse for the trip, is this luxurious, and sporty Lexus RX350 with the F-Sport performance package. It’s progenitor, the RX300 began the crossover craze in the late 1990s and continues to be a league leader in the midsize luxury crossover genre. A 13-year old example of the second generation RX330 graces my garage as my backup car. I’ll try not to allow my affection for it taint this review. While early generations of the RX were conservatively styled this new one is more bold and brash than just about anything in its class. Both Toyota and Lexus turned the page on styling a few years ago when boss Akio Toyoda announced they would no longer build boring cars. They’ve mostly been true to that goal. The huge, garish ‘spindle’ grille is surrounded by deep, intense sculpting with angular cheek vents and squinty headlight bezels. The grille reminds me of the ‘cow-catcher’ on the front of an old steam locomotives. The bold sculpting continues entirely around the vehicle being punctuated by a floating C-pillar and broad, boney shoulders. The 20-inch aluminum alloy wheels confirm it’s something special. The RX styling is certainly polarizing. I’m on the side of those who appreciate the garishness. The sun came out for the first time in a few days as I headed north through Laingsburg where I stopped for breakfast at Tammy’s Bakery and Café on the recommendations of a friend. Great cinnamon rolls, local atmosphere and small-town prices. The Lexus looked a bit out of place among the pickups and other utilitarian transports parked out front. 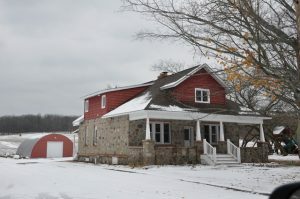 Along this easy farm-country cruise I examined the RX’s cabin with some admiration and a bit of consternation. Like the exterior, the interior is rife with intense design details that seem to celebrate complexity. While functionally loaded and aesthetically controversial the cockpit was comfortable and roomy but a bit overly busy. A multitude of small buttons low on the center stack regulate the HVAC, the little rocker-mouse that controls the large multifunction screen caused the cursor to jump around awkwardly if not managed carefully enough, and I could not find a way to set the clock. As a matter of principle, I did not dig out the manual. It should be intuitive, I contend. Getting in and out to shoot the scenery I had to constantly readjust the HVAC which became a pain with all the little buttons. I realized later I could go into the multifunction screen and probably do it more easily. But the rocker-mouse (which I used to be quite fond of) became onerous as I demanded more of it. Cargo capacity is about average for a mid-size crossover and the rear seatbacks fold easily but not quite flat. Back on the road a spotty glaze of packed show clung to the pavement as I shared the two-lane roads with farm tractors, Amish carriages, and almost no other traffic. Good thing my camera with a 200mm lens was handy as the early light drew my eye to cattle, horses, old barns and farmers harvesting corn in the big, flat fields. Something inspired a shot every few miles, it seemed, including the wind farm that stretches about 50 miles from Ithaca to Saginaw. Tall, white windmills as far as we can see are spaced randomly making for more interesting photo-ops. A couple of them seemed to be just growing out of a wood lot along a creek separating a couple of 100-acre already-harvested cornfields. 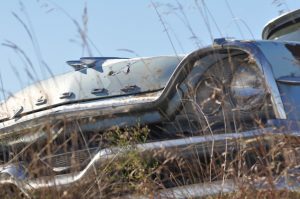 By midday my loose plan had me photographing a berm lined with old rusty cars at a junkyard near Harrison. That scene had been on my radar screen for years but I never made the time to stop. 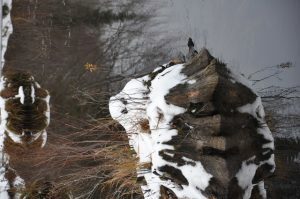 From there north the wet snow increased to a half foot or more around Grayling. As I turned back north at Bear Lake I picked one back road that became narrower by the mile until I dared go no further. The best shunpiking means being forced to turn around on occasion. 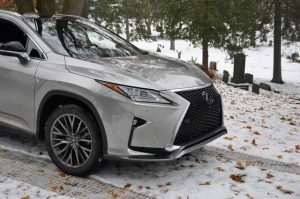 The RX350 F-Sport with all-wheel drive shows a base price of just about 50-grand and includes lots of special trim inside and out plus sport suspension, big wheels, and lots of stuff that costs extra on lesser RX models. Our particularly photogenic ‘Atomic Silver’ test car has optional blind spot monitor, parking assist, rear cross traffic alert, automatic braking and panoramic monitor. We also have the color heads-up display, hands-free rear hatch opener, panoramic moonroof and the 12.3-inch navigation screen with premium Mark Levinson audio. Bottom line shows $58,760. What a treat it was to explore in great detail and at a leisurely pace the back roads and trails around Boyne Falls and Boyne City. The Lexus’ navigation system was remarkably accurate, even with seasonal roads but, like just about all automotive nav systems it shows too little detail and is difficult to scroll around for a broader view. 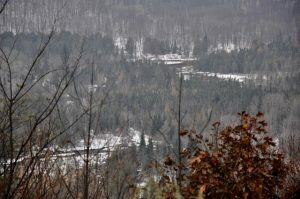 That’s how I ended up on a two-track seasonal road reaching out into the valley behind Boyne Mountain where I was treated to a few more scenic, quiet, unspoiled dead-ends . As I crossed a babbling creek I shut off the car and got out to experience natural near silence with only the brook and a few distant birds making any sound. The full-time, automatic all-wheel drive, along with traction control and ABS (all three engaged often) kept me safely on the snow-covered two-tracks. I thought I would access the skid plates a few times, but remembered this is not an off-roader and has no skid plates. 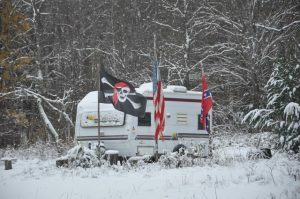 The only time I worried was when I came upon a tiny house trailer along the path just beyond Kondrat Creek where three flags flew – U.S., Confederate and skull and crossbones. Not sure what kind of character we might find hibernating there. Up and down the snowy hills was not a challenge for the RX350. The nearly 300 horsepower V6, 8-speed automatic transmission and automatic all-wheel drive are well-suited for this, or freeway cruising, or any other use. A driver-selectable Sport Mode gives us algorithms to enhance shift points, throttle response, steering and other factors. Adaptive suspension adjusts itself from stiff to really stiff but compliant enough on rough pavement or potholes not to offend. What a sweet powertrain and chassis combination, particularly compared to my tepid-performing old RX. Expect to be able to tow a decent 3,500 pounds if you have the AWD RX. The EPA expects we’ll get 19 mpg in the city, 26 on the highway and 22 combined using regular fuel. The best I could do was 23.5 cruising slowly on the country two-lanes. The worst I did was 19.5 running around town. My average for the week was 22.4. The Lexus new car warranty covers the whole RX350 for 4 years or 50,000 miles and the powertrain for 5 years or 70,000 miles. Well, these five days and around 700 miles spent on the road netted about: 10% dirt, two-track and seasonal roads; 60% two-lane, paved back roads; and 30% two-lane state highways. You’ll notice that leaves 0% for freeways. In these five days, I went to the end of the road six or seven times, usually on purpose, even discovering the stone house where I lived when little at the end of one. I explored some of the most pristine wild lands in Northern Michigan. And, I shot about 500 photos of it all. 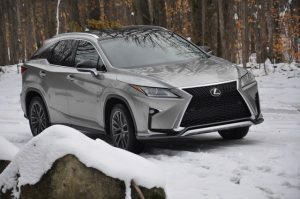 The Lexus RX350 F-Sport suited this trip well. I made some demanding explorations without needing any more capability than I had and it offered plenty of luxury and aesthetic stimulation. While some of the ergonomics and controls seems much more complex than they needed to be any new owner would acclimate without too much trouble.